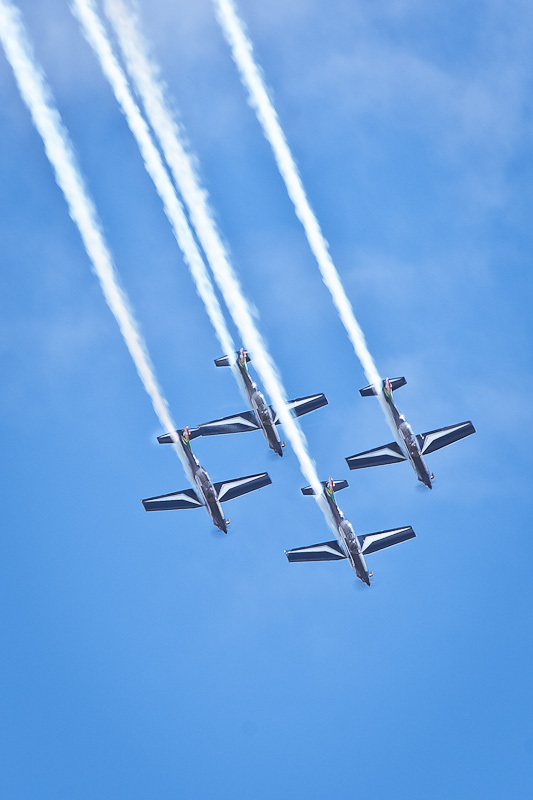 The Silver Falcons, official display team of the South African Air Force perform at an air show at AFB Overberg. Unlike the display teams of many other air forces the Silver Falcons pilots are not dedicated to the team only. Team pilots are all instructors at the Central Flying School based at AFB Langebaanweg and can only spend their spare time practising for their displays. Each display starts and ends as a five ship formation, with the body of the display alternating between manoeuvres by this four ship formation and the solo display pilot. The team currently flies the Pilatus PC-7 Astra. This entry was posted in Photos and tagged aerobatic, astra, falcons, pc7, pilatus, SAAF, silver. Bookmark the permalink.